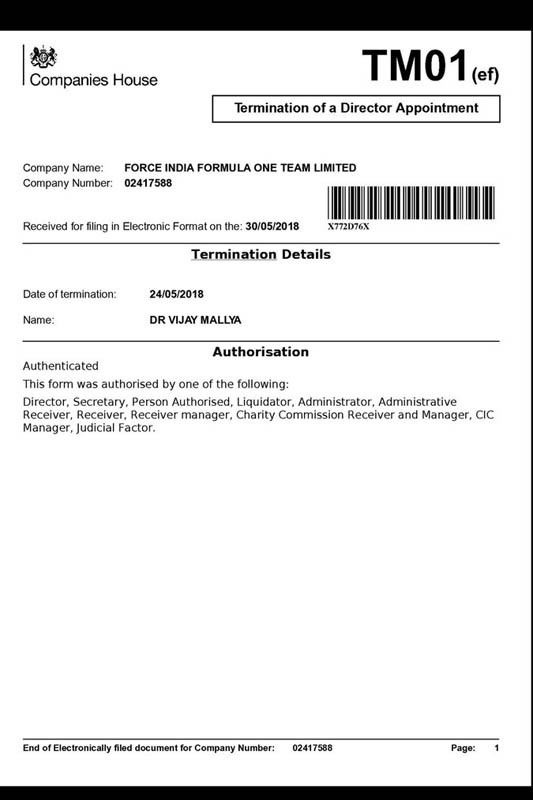 It has been revealed that Vijay Mallya has stepped down as a director of the Force India F1 team. Currently fighting extradition to India where he faces prosecution on charges of fraud and money laundering, Mallya's appearances - for obvious reasons - have become a rarity while he has even stepped back in terms of inclusion in the team's press releases. While there was talk of a name change and even a new owner, the change of name has ostensibly been deferred to next year (at least) while the energy drink, Rich Energy, linked with the buy-out simply didn't have the money. According to official documents, Mallya stepped down on May 24, the day opening practice got underway in Monaco. Whether the move indicates a possible buy-out of the team remains to be seen, however a more likely reason is that the move is intended to protect the team from any litigation against Mallya. Mallya along with Michiel Mol led a consortium that bought Spyker in 2007 for 88m euros just days after the Belgian Grand Prix. The team had originally started life in 1991 as Jordan, before being sold to Alex Shnaider in January 2005. Under Shnaider's ownership the team became Midland, only to be sold again in September 2006, over the Italian GP weekend, to Spyker Cars NV, the Dutch high performance car manufacturer. In October 2011, it was announced that the conglomerate Sahara India Pariwar had bought into the team, founder Subatra Roy Sahara appointed being co-owner and chairman in a move which saw a much welcome $100m injected into the team in return for a 42.5% stake. Mallya retained another 42.5% while the remaining 15% belongs to the Mol family. The team was renamed Sahara Force India. Roy was arrested in March 2014 after his company failed to comply with a court order to refund money raised from small investors who had been issued bonds subsequently found to be illegal. Whilst the Supreme Court ordered the group to repay an estimated $5.3bn to investors in the bond, Sahara was allegedly only able to raise 95% of its liability, which the court did not accept. Mallya subsequently revealed that while stepping down as a director he will remain team principal, while his son Siddharth, will take his place on the board. "I continue as team principal," he told Motorsport.com. "There was no compulsion anywhere to resign, it's just that I decided that my son should replace me. "I have my own legal issues to take care of," he added. "So it's better that the company remains unaffected. "Rumours keep going on and on and on, and people talk and talk and talk. That's what the F1 paddock is all about," he said in reaction to being asked whether stepping down was a precursor to the team being sold. "The finances of Force India, whether I'm selling or not selling, has been a matter of speculation on and off for many years. We don't go around with a for 'sale sign.' The bottom line is that we are focussing on getting the best performance out of the car, and that is our priority. We're focussing on getting more sponsors. "There are three shareholders," he added, "remember, I'm not the only one. If somebody comes along with a serious offer, and puts cash on the table, we will jointly consider it." ""however a more likely reason is that the move is intended to protect the team from any litigation against Mallya." I think you hit the nail Mr. Balfe.